More than a dozen current and future AE educators were honored March 6, when the Georgia Tech Center for the Enhancement of Teaching and Learning (CETL) held its annual Celebrating Teaching Day. The event is held annually to celebrate and highlight the exemplary commitment that the Institute's instructors, graduate students,post-doctoral fellows, and mentors have to the enhancement of the campus learning environment. More than a dozen AE faculty were recognized with a Thank-a-Teacher award, an honor that acknowledges the direct impact that they have made upon students in their courses and labs: Dr. Robert Braun, Dr. Narayanan Komerath, Dr. Michael Mello, Dr. JVR Prasad, Dr. Julian Rimoli, Dr. Stephen Ruffin, Dr. Joseph Saleh, Dr. David Scarborough, Dr. Marilyn Smith, and Dr. Jerry Seitzman. 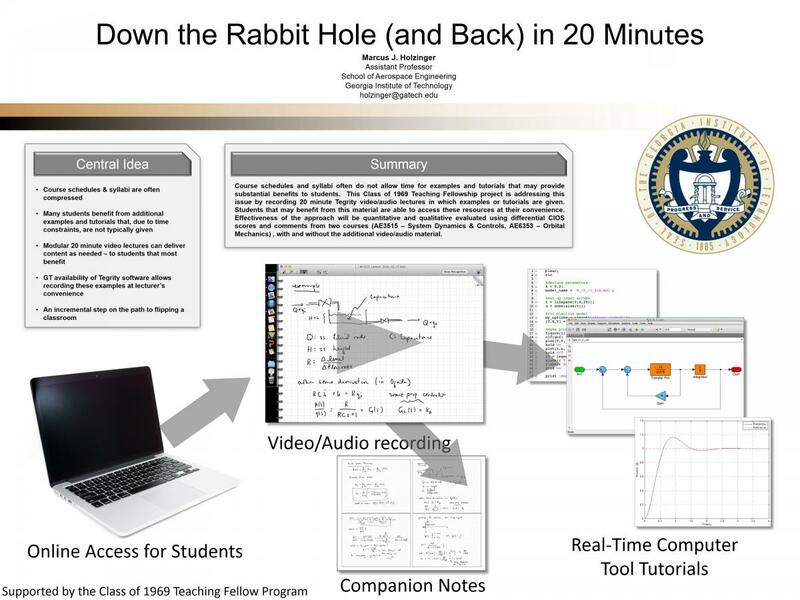 Recognized with a 2013 Class of 1969 Teaching Fellow award was Dr. Marcus Holzinger, whose poster presentation, "Down the Rabbit Hole (and Back) in 20 Minutes" was singled out for its innovative perspective. The ceremony also recognized the importance of grooming the next generation of aerospace engineering educators, awarding 2013 Tech-to-Teaching Higher Education Pathway Certificates to doctoral student Scottie-Beth Fleming and her mentor Dr. Amy Pritchett and to doctoral student Michael Miller and his faculty mentor Dr. Brian German. Fleming was also recognized for her work as the president of the GT chapter of the American Society for Engineering Education (ASEE).